Pack Size: 24" x 4" x 4"
Wall Material: polyester 170T, 450 mm P.U. Fly Material: polyester 170T, 450 mm P.U. For an activity that is supposed to be about enjoying nature and a simpler form of existence, camping can be an awfully expensive hobby. Fortunately, you don't have to spend a lot in order to get a great tent. This Cooper 1 Dome Backpacking Tent offers excellent weather protection at a price that won't make you want to pack up and spend the season indoors. Of course, we do feel that we should mention that the emphasis here is on value, not just low cost. The Cooper 1 Dome Backpacking Tent, with its shock-corded fiberglass poles and weather-resistant polyester walls, provides very effective protection from rain and wind. We're not saying you should take it on your expedition to Mt. Everest - for that you're going to want one of our tents with a Sherpa option - but if you're looking for a solid basic backpacking tent you can't do better than the Cooper. Don't let a modest budget prevent you from enjoying the outdoors. 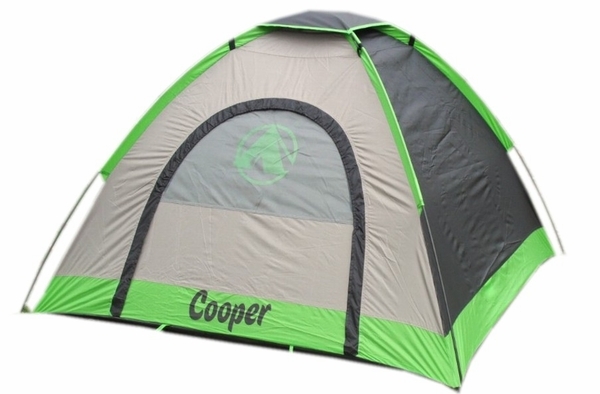 With this Cooper 1 Dome Backpacking Tent you can take that backpacking trip you've always wanted without having to worry about how you're going to pay the bills when you get back. How water-proof is this product in a downpour of rain? This tent is absolutely waterproof, provided the windows are zipped closed. This not a pop up tent, but is very easy to set up. I have a 5x7 tent, with probably a 42" height, but it's too big to heat with his body. I have it on our covered porch with a heating pad, in the winter. I have a very frightful dog, afraid of everything and won't even go into a dog house, an abused stray, but will go into a tent. I don't want to scare him by having him go through a small door. He is from the top of his head, to the ground, about 27". It's the door that has me worried. How tall is the door on this tent, as he walks through?. Will he have to bend low? 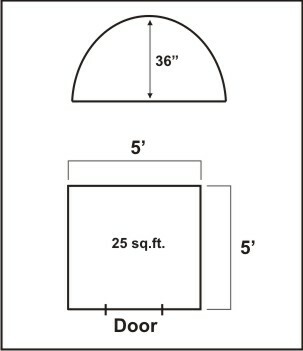 The manufacturer reports that the door height is approximately 36". Can't rain get in through the windows? Indeed, if the windows were zipped open, rain would find its way in to the tent. My grandson loves this tent. He enjoys playing inside with his family and friends, but also enjoys having his own space when he needs some alone time. He finds it very easy to assemble and it's light to carry! This backpacking tent is the perfect play space for our three-year-old son. He just loves it and its still looking good from all the use its getting. This tent is surprisingly well-made for its size. The materials, particularly the zippers, seem to be of high quality. It would be perfect for kids or small pet play. I like all the features, including a waterproof floor and flex rod supports. We camp in our pop-up camper, but we needed a tent to protect our dogs without letting them in the camper. This tent is small enough to keep them feeling secure in harsh weather. Sometimes they just go in to stay out of the sun. They love staying cozy in the tent. I recommend this product to anyone looking for a well-made, easily erected tent. The materials are so durable that I believe they will last a long time. We bought this for our kids to play in inside, and we were pretty happy with it. I can't comment on how well it would work outdoors. It was easy to put up, and the price was fair. We did notice a few tiny holes in the flooring when we first set it up, but since we were using it inside, this wasn't a problem. Our nephew was thrilled when he opened his birthday gift and he found a tent. And yes, we also got him a sleeping bag to go with it. This dome shaped tent was easy to put together, and seems quite durable. Our son gets a good amount of use out of it both inside and out! My kids love this tent, and so do I, thanks to effortless set-up (it took under five minutes), a great size, and attractive color. Our original intention was to purchase this for when we go camping with our two boxer dogs. Were not sure how it will hold up in bad weather or heavy rain, but it should work out. The size is great although it will be a tight fit for two adults and two dogs. Whether we can sleep in it is another story.